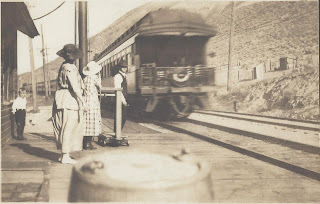 Big Bend Railroad History: 1919 Eastbound Olympian at Corfu. Allen says, "Eastbound Olympian by Corfu, 1919. Woman nearest camera is second trick operator Elsie Rudloff, nearest the train order signal mast is Leah Carrell, relief operator and wife of agent. Man is agent Hurley Carrell and son "Bux" next to building.Just visible beyond the observation car end is the stock yard and an outhouse and the chicken house on the hillside."